John Flanagan’s strengths are dramatic action, innovative conflict, and complex male characters who breathe and sweat. This fantasy adventure trilogy with a Middle Ages setting combines humor, intelligent language and complex characters to propagate a fast-paced, engaging tale awash with daring plot twists. Although mostly promoting good morals, the level of violence over these first three volumes escalates beyond what some will feel is appropriate for ten-year-olds who will read all three. There are plans for four more books. 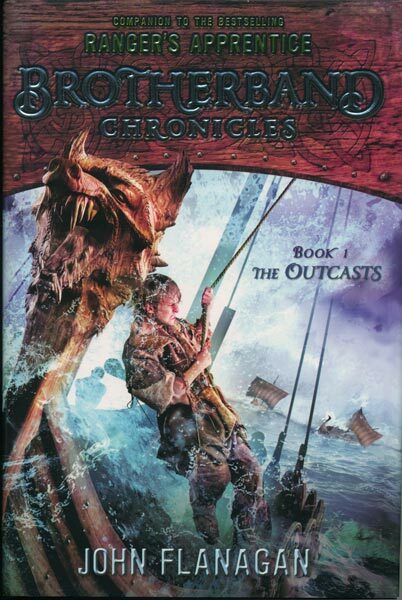 In The Outcasts, volume 1 of the trilogy, sixteen-year-old boys are divided into teams to train as Skandian warriors. Most are excited at the prospect, although it is mandatory. An assortment of underdog, misfit types known for various weaknesses – small size, poor anger management, weak vision, illicit behavior, or annoying personality traits, by default are thrust together as a team of leftovers, shorthanded by two. They call themselves the Heron Brotherband after the ship that one of them, named Hal, has built. 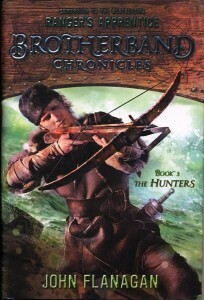 Each of the boys has his own emotional baggage, but Hal, reminiscent of Will from the author’s previous Ranger’s Apprentice series, gathers them into a team and channels their strengths. Skandians are seafarers and with Hal’s innovations to the Heron and training for his nascent crew, they evolve into thrilling masters of the winds and sea. Hal, as the skirl, or leader, of this Skandian brotherhood, wrangles with himself over all aspects of his choices and feels deep responsibility to his crew. Identified early on as an inventor, his creative thinking in the iconoclastic design of strategic equipment and weaponry and in his quick-witted tactics in dealing with other people or in conflict make him an apt, heroic leader who must track, then contend with, the devious and malevolent pirate captain Zavac and his murderous crew. Hal and each of his crew have moments of weakness, but share a desire to work together for their common goals. Augmenting the strongly individual Brotherband members is a mentor, Thorn, a one-armed Seawolf and former alcoholic who helps to train the boys and hone their skills. This gives the characters time to strengthen their understanding of one another, thus empowering their bond and making them a far more effective team. The Brotherband exceeds everyone’s expectations during training, including those of the Oberjarl, Erak Starfollower. In the glow of their victory however, the young Brotherband makes a huge mistake that leads to a compelling cliffhanger at the end of the book. In The Invaders (vol. 2), the Brotherband pursues Zavak and his men to retrieve the Skandians’ most valued treasure, which the pirates had absconded with. There is a scene where a victim of the pirates’ greed is tortured, then murdered in spite of his having given the information they wanted. The chase leads the Brotherband to Limmat, fully under siege by the dastardly pirates. Here Hal and company meet Lydia Demarek, a Limmatan with a talent for hunting with a clever weapon choice the author has given her – it requires skill rather than brute force to be deadly. Her grandfather and parents were killed by pirates so she wants vengeance and collaborates with a clandestine band of other Limmatan teens. As a rebel faction, they join forces with the Herons. In a dramatic episode Hal and the other teen warriors prove deadly against the pirates in an incendiary battle waged with a weapon Hal has effectively adapted, creative use of limited means, and excellent war strategy on Hal’s part. The Brotherband and their allies inflict explosive, fatal defeat on the pirates, thus saving the beleaguered town. However, Zavak slithers away in his black ship Raven with the goods. When he does damage to an ally of the Brotherband, Hal is left with a compelling moral dilemma. His resolve at the end of the book leaves the reader breathless, awaiting The Hunters (vol. 3), scheduled to be released October 30. The Hunters opens as the Heron has crossed the Stormwhite Sea heading for Raguza, a pirate stronghold on the Schuyt River. On board are the eight original members of the Brotherband including one who was injured during the battle, and also Lydia the Limmatan hunter, Thorn the Seawolf, and a captured Magyaran pirate. Lydia has made a commitment as the only female involved in the hazardous venture ahead. She proved her effectiveness at killing pirates in the Limmatan battle and will follow that now with additional strategic skills she alone in this group has. Thorn comes to admire her abilities, expanding his own parameters and the boys accept her, in spite of some reservations about having a team member who is female. She has an active role in the harrowing conflicts that ensue and is gradually recognized as a full member of the crew, signified by her being given the new Brotherband insignia to wear. Her problem solving skills and fighting abilities are on a par with that of the boys. Her presence injects moments of light romantic competition, although these are appropriately not major factors in the story. One of the boys takes up a craft normally thought of as women’s work during the era of the story’s setting and initially receives ridicule for it until it proves to be of practical value and eventually becomes symbolic of unity. As with The Outcasts and The Invaders, in The Hunters the tense conflict-laden moments in the story are offset by interjected humor. Characters banter, sparring hilariously with non sequitors, withering looks, puns and sarcasm. They sound like a real bunch of guys (and gal). Pivotal parts of The Hunters seriously challenge Hal’s abilities and decision-making skills as the Brotherband get themselves deep into the pirates’ treacherous snakepit. Each time he is faced with potentially deadly choices, Hal is sleepless while turning every option over in his mind to be sure the strategy he takes is the most propitious. One of these involves a natural obstacle that requires supreme effort and cooperation from everyone on board for them to survive. Another requires psychological strategy and insight into the minds of devious people. Hal takes risks, always including everyone else in the group to achieve consensus, elicit additional ideas, and factor out problems he has not foreseen. He is a wise and fair leader of this deadly group of pirate hunters. Hal and crew work on their skills and strategies constantly to improve their chances. However, like the River Dan, this plot has many surprising twists and turns. By page 315 this reader was convinced that Zavak had taken the all-important goal of the Brotherband’s pursuit from where Hal thought it was to secrete it somewhere new, and that Zavac in the Raven would escape yet again, that elusive snake. At that moment the local Korpaljo made a declaration that will make the Brotherband’s goals impossible to achieve – even for them. So Hal surprises everyone by suggesting what seems like a truly foolhardy move. Everyone is suitably shocked and his own crew doubt this decision. He adds a caveat that slightly narrows the odds, but it will be a fight to the death and most bets are with the Magyarans. Since the Brotherband Chronicles is about teens who have trained to be warriors, the violence aspect is embedded. In The Outcasts it is mild – they are still in training – and this part of the story could be for kids 10 and up. Once the Brotherband members have graduated and head out on their risky mission, the violence becomes more overt. There are accounts of the murderous behavior of Zavak and his men in torturing the doomed captive ship captain, even going beyond the pain they need to inflict to get the information they want. During the battle in Limmat many pirates are killed by Heron crew members and their allies using swords, arrows, fire, and other weapons. One of the Heron crew is wounded with an arrow and nearly dies. The purpose of the fighting at Limmat is to save the townspeople from the pirates, so the violence is not gratuitous, but perhaps the readership of this volume should be 12 and up. Then in The Hunters, Hal and his crew are actively going after the pirates in order to retrieve the object of their quest and thereby clear their names back in Hallsholm. Lydia’s purpose is revenge. These are not defensive or altruistic motives and the actions of Hal and his crew result in many deaths, some of which are hand-to-hand. Although the pirates have been a deadly scourge and needed to be dealt with, they are still humans. There is no savoring of blood and gore on the part of the Brotherband, but there is also no mercy, making this more appropriate for older kids – perhaps 14 and up. Parents should decide. Is this story educational? The sailing and ship handling certainly make seafaring skills more understandable and exciting and the author has provided a glossary of nautical terms at the beginning, a good take-away. The changing relationships and growing social strategies between the characters will give young readers good insights into personal dynamics. Advanced vocabulary throughout – diffidently, supercilious, placatory, denouement, e.g. – is paired with humor, faux expletives like “Orlog’s toenails!” along with contemporary expressions like “slow on the uptake”. Is it fun to read? Oh, yes. 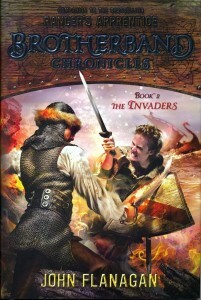 The Brotherband Chronicles series is compelling, dramatic, entertaining and suspenseful. This entry was posted in children's books, Norse, reviews, Writing today and tagged children's books, middle grade fiction, traditional publishing, YA fiction. Bookmark the permalink. Post a comment or leave a trackback: Trackback URL.